Members can find singles as well as couples, who are open minded and are ready and willing to chat or connect and explore bisexual relationships. Those looking for a lover or for an intimate relationship can make use of the unique features of the site to enter into such relationships. The site has more than 900,000 bisexual profiles and is affiliated to Successful Match. It is easy to sign up at this bisexual dating site by using your email and entering a password. You can also sign in using your Facebook account. Apart from this, there is also a Quick Search feature, where you only enter information regarding whether you are a Bi Man or a Bi Woman, the age requirements of your prospective partner, the country, state and so on and then move on to finding the matches. It is easy to create your profile after the free sign up by merely following the steps. It only involves sketching your personality, your lifestyle and what you are looking for in the bisexual relationship. The questionnaire that is supplied by the site helps highlight personality traits and your interests and you can add a short narrative. You can then post your photos, by uploading them from your device or use the Add or Manage photos option. With a free sign up, members can access unique features, such as the dating ideas of other members along with their profile and details. The ideas are neatly categorized under clear headings, such as café outings, dinner, culinary adventures, lunch and other dating ideas that members have come up with. You can also read the comments of other members related to their dating ideas and know more about them. The forums offer an interesting means of sharing your interests and ideas with others on different topics. You can also create a topic, start your own blog or follow threads, make comments or suggestions, read the bisexual experiences of other members, ask questions and know more about their problems. Finding a suitable bi sexual partner is very easy, as there are many distinct categories, such as Bi curious members in a specific location, couple who are seeking a bi female or a bi guy to join them and many other specific requirements. This makes it very easy to find partners in a particular place that you wish. You can view recent posts or active posts of blogs and select the most popular ones. What’s more, you can also add your blog to your social networking profile, such as Facebook or Twitter. For those who are new to the bisexual dating scene, there are also many dating tips available. These include first dates tips; advanced tips as well as basic ones; profile tips and so on. Members can also get tips regarding the type of photos they could post to create a better impression. Apart from advice and tips, they can also access the success stories of others and share their own success stories to inspire other bisexuals to find the right mate. Some other unique features of BiCupid.com are sharing videos and sending or receiving greeting cards. In addition, there is a daily news service, where you can read about the latest news in bisexual love, such as the latest FDA policies regarding gay or bisexual men and women. 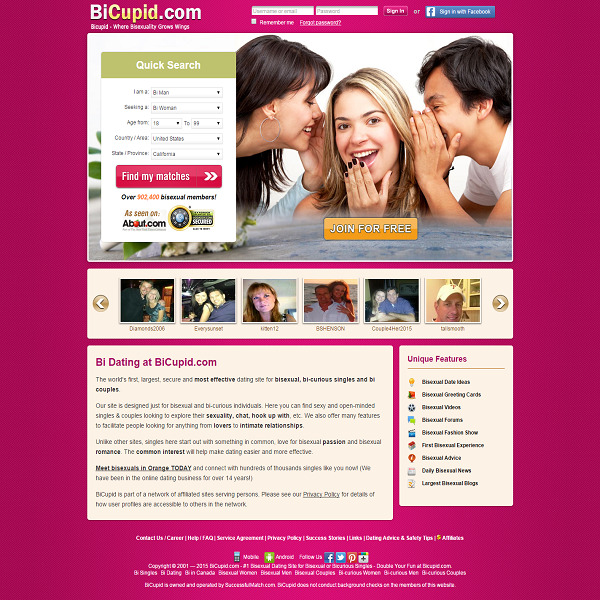 BiCupid.com is among the top sites for bisexual dating and offers a friendly, comfortable environment. You can find a wide range of profiles that are on the lookout for penpals, lovers or intimate relationships. However, if you upgrade to the Gold membership, you must know that the payment through your credit card will be automatically renewed unless you turn the auto renewal feature off, once you sign up.